Click here to see more gift ideas. 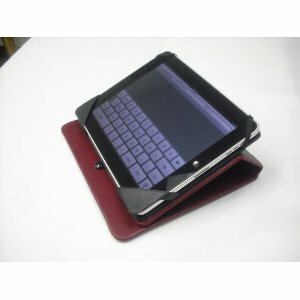 If you’ve been looking for a distinctive iPad case – available for whichever model you have, you’ve finally found it. Most cases sold online claim to be leather but are often “bonded” leather which is manufactured leather (like particle board is to furniture). You can’t tell them from vinyl. THIS case is individually handcrafted to your exact model using the highest quality leather normally used in upholstery so it’s thick, soft and durable. For an additional $10, you can personalize this iPad cover with your name, a friends name, name & company, etc., on the lower right hand corner. Colors to choose from include black, chocolate, wine, navy & tobacco. This model uses our most luxurious Glaze Leather which is a protected cowhide with a distinctive glazed, crackle finish. An Old World, aged-leather with a buttery hand, the rustic look is achieved on a full grain, aniline drum-dyed leather and offered in 5 colors. Glaze Leather only improves with age, standing the test of time. This leather FEELS so great to the touch, you’ll find yourself caressing it! We’ve designed the case with the end user in mind. It’s easy to get your iPad in and out, yet when in, the design will protect your iPad and hold it securely in place while STILL keeping all buttons, speakers & connections accessible. Cover features generous pocket for important papers. Folds back to allow angled typing and if you completely fold cover behind itself, it will stand upright for watching movies or using for demonstrations. We’ve also included a small band to hold your stylus or pen inside the cover. 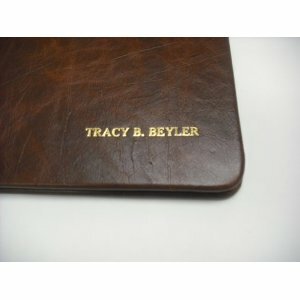 All covers are individually handcrafted at Grimm Book Bindery, Inc., by our skilled bookbinders. This is a high end durable book cover modified to hold your iPad so it looks and feels like you’re carrying a classic book around instead of a cheap vinyl case.